Stanley 1996 Hooked trimmin knife blades (Pack of 5). 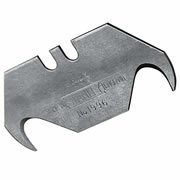 Sharpened hook blade with point ideal for cutting sheet material from rolls, in particular floor, roof & plastic coverings. Suitable for all Stanley knives.